Reconstruction of 26 rue du Depart, Paris based on 1926 Photo by Paul Delbo. 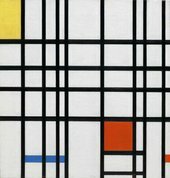 Dutch painter Piet Mondrian (1872–1944) is renowned as one of the most important contributors to the development of abstraction at the beginning of the 20th century, and his stunning and influential works are recognised by everyone from art lovers to students of architecture and graphic design. But what of the man himself? What factors led him to develop this familiar signature style? Mondrian and his Studios marks the 70th anniversary of the artist’s death and considers not only Mondrian’s significance, but also the circumstances (in both life and painting) that led him to make the switch from successful figurative artist in his homeland to international radical innovator. Taking visitors through Paris, London and eventually New York, the exhibition tracks Mondrian’s personal and aesthetic journey, and finds threads between the two: a major highlight is the immersive life-size reconstruction of his Paris studio, which allows visitors to inhabit not only Mondrian’s creative world but also a three-dimensional version of his colourful experiments in painting. His first move – motivated by the pursuit of more fertile creative ground – saw him leave Holland for Paris in 1911 and brought about considerable change. Mondrian dropped the second ‘a’ from the Dutch spelling of his name (Mondriaan) as a signal of intent and immersed himself in the Parisian avant-garde community, but encountering Picasso's experiments with cubism would prove even more momentous. 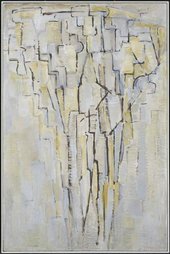 Highlighting the transformational impact of Picasso on Mondrian and his work, the exhibition includes pieces such as The Tree A 1913 which demonstrates how he began to shift from figurative paintings and move toward abstraction. 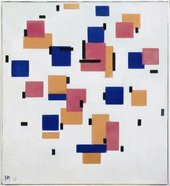 It was in Paris (where he began to utilise colour planes on his walls) that Mondrian’s evolution toward the astonishing work he is so widely recognised for today began in earnest, culminating in the production of key neo-plastic works. Mondrian and his Studios presents the largest collection in the UK to date of these iconic gridded works. Leaving Paris and his celebrated Rue du Départ studio behind, Mondrian then moved to London, where according to Barbara Hepworth, once again ‘his wonderful squares of primary colours climbed up the walls’. Though not insignificant, his stay in London proved brief (1938-1940). Leaving the UK via Liverpool for America, the exhibition includes the passenger list bearing Mondrian’s name, and poignantly, his departure point can be viewed out of the gallery window. Moving to New York would prove his final adventure (he died in Manhattan, aged 71). Now in his late 60s, Mondrian still had time to incorporate even more fully the syncopated rhythm of jazz, and boogie-woogie in-particular, into his practice. Including record sleeves, those vibrant trademark colour planes from his studio walls and a film made by his friend and heir Harry Holtzman, this exhibition offers up tantalising glimpses of the master of abstraction’s next creative destination. …I was intrigued to walk through the reconstruction of his studio, to reflect upon him living and working there, observing the colours and the way he composed this space, the contrast of dynamic colour against quite 'ordinary' things, the people that came and visited, the conversations that took place there and Mondrian. It certainly is an experience! Tate Liverpool has been working closely with Plus Tate partner Turner Contemporary throughout Mondrian and his Studios. Turner Contemporary, based in Margate, presents the exhibition Mondrian and Colour in collaboration with the Bucerius Kunst Forum, Hamburg until 21 September 2014. Mondrian and Colour explores the early period of the artist’s career, tracing the painter’s use of colour from figuration to early abstraction. Together, the exhibitions will focus the UK’s attention on this pioneer of abstract art, timed to coincide with the 70th anniversary of his death. 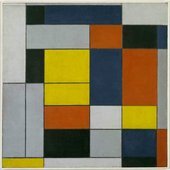 Teachers' pack with in-depth analysis, activity ideas and further resources on the Mondrian and his Studios exhibition.